Enhancing knowledge and understanding on how to assess loss and damage due to climate change is the main agenda of a two-day workshop which started in Apia yesterday. The meeting is being held at the Moanalisa Hotel, Vaitele. 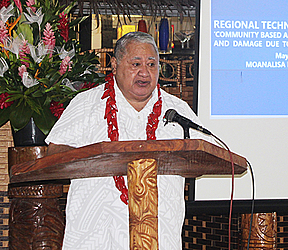 Prime Minister Tuilaepa Sailele Malielegaoi opened the conference, speaking about the importance of addressing climate change. He added that Samoa is committed to combating climate change through cutting greenhouse gas emissions, adapting to climate change and negotiating strong and legally binding international agreements. He reminded the participants how important it is to work together, discuss and share ideas on how to help our communities from experiencing loss and damages from climate change. The meeting is organized by U.N.E.S.C.O in close collaboration with the University of the South Pacific – Pacific Centre for Environment and Sustainable Development (PaCE-SD ) and the Samoa National Commission for U.N.E.S.C.O, which is part of the Ministry of Education, Sports and Culture. The University of the South Pacific’s PaCE-SD which is based in Suva, Fiji, are also partners on the implementation of this project, which is funded by the Government of Malaysia. Dr. Morgan Wairiu, the Deputy Director of PaCE-SD, U.S.P, highlighted the importance of looking at loss and damages within our communities due to climate change. “Loss and damage is included as one of the important issues in the Paris Agreement so there is a call to enhance understanding as well as collaboration and support for this subject area,” he said. He told the Samoa Observer that this particular project is not focused specifically on the environment and science. It looks at the community as a whole. “We look at assessing loss and damage in terms of culture, environment, knowledge, human security, tourism, economic and so forth. That’s why we talk about loss and damage both non-economically and economically. “Because with non-economic impacts, we can look at people’s culture and their way of life and how it has been affected with the increase in climate changes. For example, in Vanuatu, the elders use the beach to transfer some of their customs and values down to the younger generation. Dr. Morgan said they are aiming to have a thorough discussion and review of the toolkit in this meeting. The tool kit is a set of steps we can use to asses loss and damages because of climate change. However, this project is focused specifically on agriculture and tourism. Today is the last day of this meeting.